The Global Volcanism Program has no activity reports for Taveuni. The Global Volcanism Program has no Weekly Reports available for Taveuni. The Global Volcanism Program has no Bulletin Reports available for Taveuni. Straddling the 180 degree meridian, Taveuni, the third largest of the Fiji islands, is known as the "Garden Island" as a result of its rich volcanic soils. The massive, elongated basaltic shield volcano includes approximately 150 volcanic cones along a NE-SW rift that extends the length of the 40-km-long island. A few cones in the central part of the volcano occur to the west of the axial rift zone. At least 58 eruptions have occurred on Taveuni since the first known human settlements of the Fiji Islands about 950-750 BCE; all of these eruptions affected the southern two-thirds of the island. A period of voluminous eruptions between about 300 and 500 CE caused abandonment of the southern part the island until about 1100 CE. The latest known eruption produced a lava flow at the southern tip sometime between about 1450 and 1650 CE. Cronin S J, Bebbeington M, Lai C D, 2001. A probabalistic assessment of eruption recurrence on Taveuni volcano, Fiji. Bull Volcanol, 63: 274-288. Cronin S J, Neall V E, 2001. Holocene volcanic geology, volcanic hazard, and risk on Taveuni, Fiji. New Zeal J Geol Geophys, 44: 417-437. Cronin S J, Neall V E, 2000. Impacts of volcanism in pre-European inhabitants of Taveuni, Fiji. Bull Volcanol, 62: 199-213. Frost E L, 1974. Taveuni, Fiji. Asian Pacific Arch Ser, 6: 1-175. Rodda P, 1980. (pers. comm.). Woodhall D, 1985. Geology of Taveuni, Qamea, Laucala, Cikobia and adjacent islands. Mineral Resour Dept Fiji, 1:50,000 geol map. There is no Deformation History data available for Taveuni. There is no Emissions History data available for Taveuni. The 40-km-long Taveuni Island straddles the international date line. Taveuni is the third largest of the Fiji islands and is known as the "Garden Island" because of its rich volcanic soils. 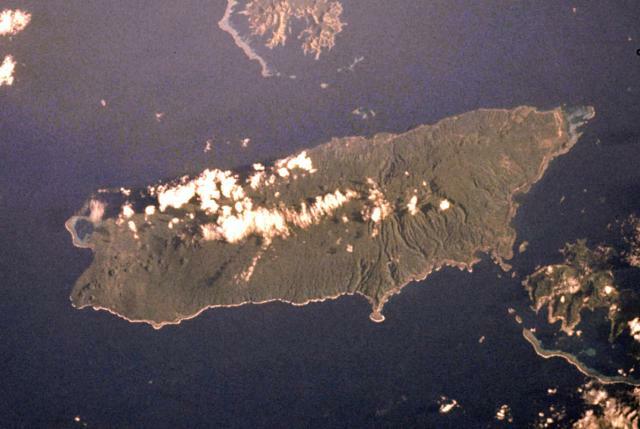 The massive shield volcano is dotted by about 150 volcanic cones along a NE-SW rift extending the length of the island; some of the SW-flank vents are visible on this Space Shuttle image (with north to the upper right). Taveuni has been frequently active during the Holocene, and eruptions impacted island settlements in prehistorical time. NASA Space Shuttle image STS111-719-74, 2002 (http://eol.jsc.nasa.gov/). There are no samples for Taveuni in the Smithsonian's NMNH Department of Mineral Sciences Rock and Ore collection. Large Eruptions of Taveuni Information about large Quaternary eruptions (VEI >= 4) is cataloged in the Large Magnitude Explosive Volcanic Eruptions (LaMEVE) database of the Volcano Global Risk Identification and Analysis Project (VOGRIPA).